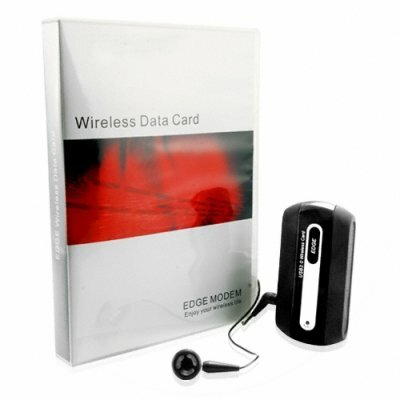 Successfully Added EDGE Quad-Band Wireless Modem - SIM Card Internet Tool to your Shopping Cart. EDGE SIM card internet connection adapter/modem for computers. Never be caught without a high speed internet connection again with this lightning fast EDGE network USB data card. Whether you are a road warrior always needing an on demand wireless connection, looking to bypass overpriced wireless charges in your current location, or simply retrofitting a computer without a wireless connection, you have made a great choice. This quad band modem provides you with a regular internet connection as well as the ability to still use your SIM card to make and receive phone calls and text messages while you are online. Simply plug in via USB, install the intuitive software and you're ready to surf - easy as that. This model has a slightly thicker housing to absorb extra wear and tear. Always have the internet with you, on the road, in the office, worldwide - wherever there is cell coverage. Source this extremely useful wireless internet connection product from Chinavasion and be among the select few who have such cutting edge high-tech products.